ls Ann Wilson's Financial Freedom University Right For Me? Is it worth it? Below you'll find some of the tough questions we get asked about FFU - along with our honest answers. FFU isn't right for everyone. We'll tell you everything about the programme and what it takes so you can make the best decision for you. WHEN DOES FINANCIAL FREEDOM UNIVERSITY START? WHAT HAPPENS IF I MISS ONE OF THE OVERVIEW AND Q&A CALLS? Life is full, I get it! That’s why if you’re traveling, have a big project happening or going on an exciting adventure without internet access - you don’t have to worry about missing out. You get lifetime access to Financial Freedom University. All your training content is available online and you can access it whenever and wherever you have available time. 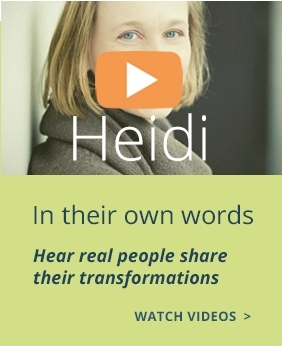 The videos, audios, tools, and transcripts are all downloadable to your computer so you can access the training when you are off-line and they are all also viewable on your mobile phone or tablet. I know many online training programmes only allow you to consume the material online but you getting the training and financial empowerment you need is way more important to me than worrying that this information may end up being shared. All your training content is available online and you can access it whenever and wherever you have available time. The videos, audios, tools, and transcripts are all downloadable to your computer so you can access the training when you are off-line and they are all also viewable on your mobile phone or tablet. I know many online training programmes only allow you to consume the material online but you getting the training and financial empowerment you need is way more important to me than worrying that this information may end up being shared. You can also never “fall behind.” Creating your financial freedom is a journey, not a one hit wonder and Financial Freedom University has been designed to support you in your success and fit into your lifestyle. You’ll learn at the pace that works best for you, in the format that works best for you and when it works best for you. You also get a Financial Freedom Progress Tracker which lets you set your own pace and celebrate your achievement as you make progress through the training and all your Financial Freedom training materials will be there for you for as long as you need them. The first Module of content is available for you right now and the first live training call with Ann is on the 13th August 2018. Every two weeks there is a live overview and Q&A call with me (Ann). If you can’t make a call, it will be recorded and available for you to listen to and download within a day of the call. You can send your questions in ahead of time and I will answer them on the calls. In addition, you get access to and become part of the incredibly supportive FFU Community group. It this safe and supportive space you ask questions and share your progress and both I (Ann) and your fellow FFU’ers will help you to keep moving forward towards your financially free life. WHAT IF I DON’T HAVE ANY INVESTMENTS YET? WILL THIS HELP ME FIGURE OUT HOW TO FREE UP MONEY AND TO START INVESTING? While many FFU’ers have some investments around the place when they start FFU, either in the stock market in different structures like Pensions, Endowments; RA’s, 401K’s, ROTH’s, ISA, TFSA, Superannuations and so forth; or some investment property; or passive income businesses like Network Marketing, Royalties, Online programmes, Affiliate marketing or any of the hundreds of different forms we cover in the Passive Passions module - many start with no investments yet in place at all. FFU teaches you how to create new assets (investments) AND how to evaluate the assets (investments) you may already have and determine what to do with them to ensure they are working for you and not the person that sold them to you and that they fit into your FInancial Freedom Plan. FFU is so much more than just teaching you how to create assets that earn you income and create your financial freedom. In FFU you determine exactly where you are right now in your money world, what you need in place to be financially free, the recipe to get you there, how to free up money to fill up your asset pots and increase the flow into your life, how to eliminate debt, and how to free yourself from money worries so you enjoy the entire journey. I get this question almost every day from people in their 20’s, 30’s, 40’s, 50’s, 60’s and 70’s. Interestingly the question has nothing to do with age and everything to do with self belief. I cannot say if you are “too old” or not, because creating financial freedom and living the life you want free of money worries has absolutely nothing to do with age. There are different actions to take and “levers” to focus on depending on your age, your financial goals and the time you want to achieve them in - and FFU will teach you all these. Whatever you “believe” about yourself will have a significant impact on your success. This is why we spend a significant amount of time and energy in Financial Freedom University on mindset and your beliefs about yourself, money and wealth. I am also giving you two tickets to “Financially Free You LIVE”. This is an incredibly powerful 3 day live event where we work extensively on the mental barriers - like any beliefs you have about “being too old” - that may be preventing you from reclaiming your dreams and living the life you really want. 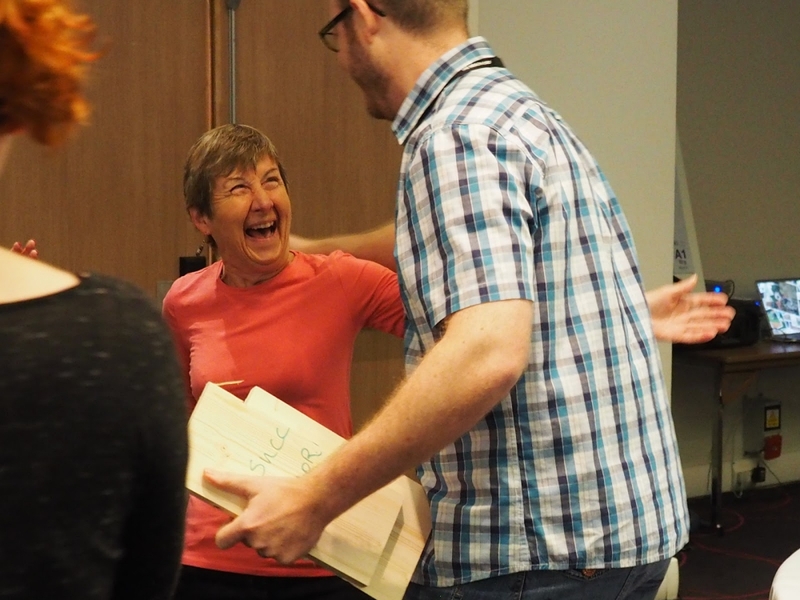 Here’s a photo of one of our awesome FFU’ers smashing through her limiting beliefs at Financially Free You Live - at the age of 72! HOW MUCH TIME DO I NEED TO COMMIT TO FINANCIAL FREEDOM UNIVERSITY? It’s simple: the more you put into Financial Freedom University, the more you’ll get out of it AND that time can be spread out over as long a period as you require. The first 4 modules in FFU are the most intensive and require the most amount of time. This is because as they are all about designing your unique financial freedom plan, getting your Wealth Kitchen set up, and ensuring you have a deep and strong foundation in place on which to build your financial freedom and create sustainable wealth. If you choose to go through the program live with me and fully participate in every aspect of the course - watching all the videos, attending all live training calls; posting questions; giving and receiving support in the FFU community group; etc - a very rough time estimate would be 5-10 hours per week for the first four weeks, and 3-7 hours per week for the remaining six weeks of the program. If you simply want to digest the material and set your own financial freedom journey pace, I suggest you set aside 3-5 hours a week to maintain momentum. Because you have access to FFU for life - you can also choose to do it in whatever way works for you - remember - your money is meant to serve and support you - not stress you out. There is no “magic pill”, “silver bullet” or “kaching event” that will create your financial freedom. Your dream require energy to make them happen because they are worth it. You’re embarking on wonderful journey - at times this journey will feel intense, time consuming, demanding and even frustrating - and most of all this journey will be deeply rewarding and along the way you will make the most amazing friends and discover so much about yourself and what you are capable of achieving. I’M GOING THROUGH A BIG LIFE CHANGE RIGHT NOW, SHOULD I WAIT UNTIL I’M MORE SETTLED BEFORE I DO FFU? When we are in transition it is easy to believe we don’t have the “head-space”, time or energy to deal with our financial well being and when things have “calmed down” and “settled” we’ll get to it. The truth is - there is possibly nothing more important during these times of change than ensuring you are supported and safe financially and that you are making financial decisions based on solid financial foundations and information. I DON’T THINK I HAVE TIME FOR THIS RIGHT NOW - CAN I JOIN LATER? Can I be frank? You have to figure out what’s important. Unfortunately too many of us sacrifice the “important” for the “urgent” and never get to those things that really make the difference. If you want to make the kind of progress you’re after, you have to reverse that pattern. I’m often asked “Ann,when is the best time to start investing”. My answer is the same. “The best time to start get money working for you was 20 years ago, the second best time is today”. Don’t put your freedom ‘on ice’! If you want to create the life you really desire with your money supporting you, then start now. IS FINANCIAL FREEDOM UNIVERSITY WORTH IT? 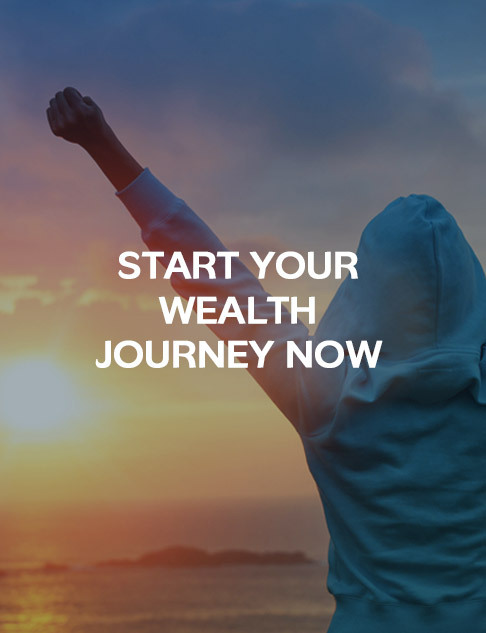 Each person's starting point and financial journey is completely unique. You know what you are wanting to transform in your financial world. What is achieving that worth to you? If it’s worth more than $1997 to you, then yes, FINANCIAL FREEDOM UNIVERSITY will be one of the best investments you’ll make this year and I believe in your life. I know that if you take action and do the work, you will achieve amazing results in your financial world and your life. Important: To be eligible for the 1 year refund, we require your completed homeplay from modules 1 to 5 and module 9. This means you must take action and participate in this program. WILL FINANCIAL FREEDOM UNIVERSITY WORK FOR ME? If you buy a vacuum cleaner but never plug it in and give it a spin - can you say whether it works or not? If you buy a computer to write your book but never sit down and write - do you blame it on the computer? You are the Chef. Financial Freedom University will give you all the ingredients, recipes, knowledge, tools and skills to create your financial freedom but it won’t happen without you doing the work. If you’re expecting FFU, or anything else, to magically solve your money problems, and create your financial freedom - please do not sign-up. FFU is not some “get rich” quick program. I know that if you do the work, you will achieve amazing results in your financial world and your life. I’ll be challenging you to think differently, to behave differently, and to become an amazing leader to your money “and in your life” so that you get to experience financial liberation and live your unlimited life. You have to take action. Nothing changes without action and doing something new. You can read all the books you like, listen to all the audios and watch the videos - but the magic happens when you APPLY what you’re learning. Success in this program (and life) requires that you take responsibility for your results and play full out too. I play full out and put a tremendous amount of time and energy into Financial Freedom University and into supporting the awesome FFU’ers on their journey. You need to match that energy. DO I GET ACCESS TO ALL OF FINANCIAL FREEDOM UNIVERSITY AT ONCE? No. The Financial Freedom University curriculum is carefully designed to set you up for success with the training in each module building upon the learning and tools put in place in the preceding module. Modules 1 through to 5 ensure you have all the components of your financial “kitchen” in place and the body of your financial freedom plan working well. Then you move onto creating and refining your assets within the subsequent modules. This is a proven program and it’s vital that you follow the system. Once you complete the full FInancial Freedom University program, you get lifetime access and can re-visit the Modules in any order you like. WILL THERE BE GROUP WORK? 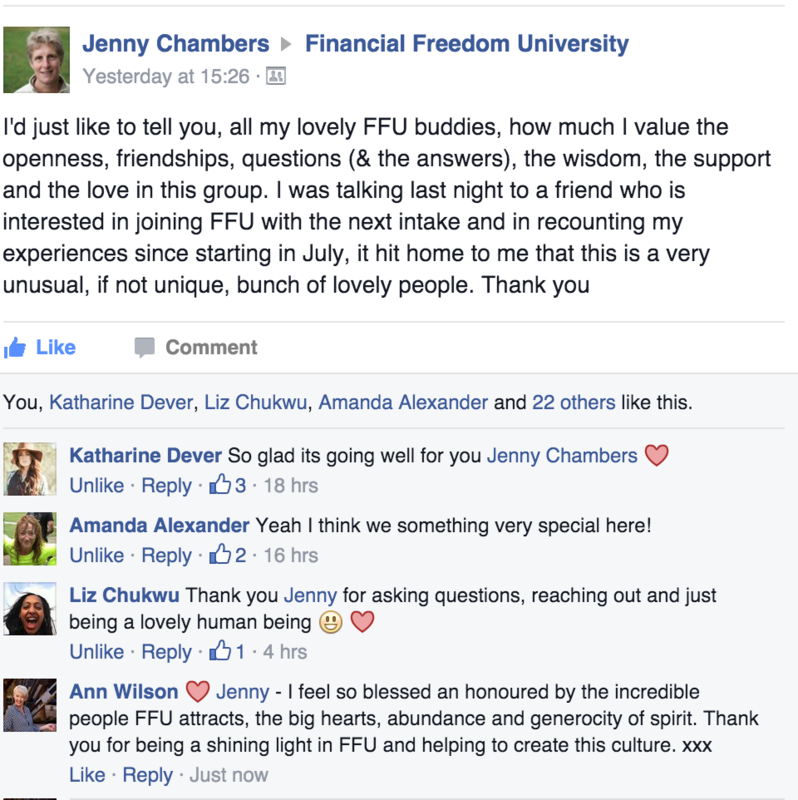 We have a very active, supportive, abundant and quite frankly a special FFU community which I am very proud of. The abundance and generosity of FFU’ers and the willingness of the community to share their learning and help each other achieve their freedom is amazing. When it comes to the money stuff, the FFU community provides a safe platform for important discussions and conversations which otherwise wouldn’t happen. How much or little you choose to get involved with the online community is up to you. If you prefer to work on your own, that’s great too. In addition to the online community, many FFU’ers choose to form “Wealth Pods’ where they meet up and support each other in smaller groups either at live gatherings in their local area or virtually. I know that everyone has a different learning style and it’s fully up to you to form connections with others, if that’s what you’d like. While I encourage community and group sharing, you absolutely do not need to do anything you are not completely comfortable with. HOW LONG DO I HAVE TO DECIDE IF WANT TO JOIN FINANCIAL FREEDOM UNIVERSITY? The FFU 2018 registration period is currently open and will close on July 28th. Once registration closes we start the training. You can’t join Financial Freedom University outside of the registration period. WILL I GET ONE-ON-ONE COACHING OR FEEDBACK FROM ANN? This is a group coaching program. Every two weeks you will have a live overview and Q&A call with Ann. Ann is also very active in the FFU community and answers as many questions and comments as she can, however we cannot guarantee personal feedback from Ann for each question in the portal and community. I’VE GOT DEBT. I REALLY WANT TO LEARN EVERYTHING IN FINANCIAL FREEDOM UNIVERSITY BUT SHOULDN’T I CLEAR MY DEBT FIRST? After years of helping people create Financial Freedom I’ve discovered that if you only focus on debt without the full financial freedom framework and learn how to create assets that expand and build your wealth at the same time you are setting yourself up for failure. Energy flows where focus goes and you must focus on where you want to end up - which is your freedom. If you only focus on getting out of debt, that is all you will get. Without the skills and habits of managing your money through wealth pie, paying yourself first, ensuring your insurances and right, and learning how to invest and create assets, at the same time as implementing the powerful debt blitzing strategy, you will end up with an empty asset drawer and your money will not be able to work for you. 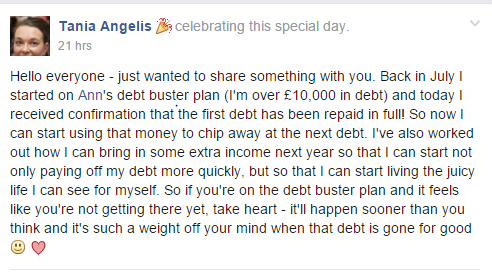 This is the primary reason that so many people end up back in debt after they have managed to clear it all. So if you don’t feel ready to start because you are waiting until you have all your money “stuff” sorted out, or all your debt paid off, or until things are just more settled then STOP. Understand this, those things will get sorted out once you choose to value yourself, once you invest in your financial future first. I KNOW ANN HAS LIVED AND INVESTED IN LOTS OF COUNTRIES. ARE THE STRATEGIES AND KNOWLEDGE I’LL LEARN IN FFU RELEVANT IF I LIVE OUTSIDE THE USA / UK / EUROPE / UAE / AUSTRALIA / CANADA OR SOUTH AFRICA ? Money is universal and 95% of the skills, tools and knowledge you will learn in Financial Freedom University apply in every country. 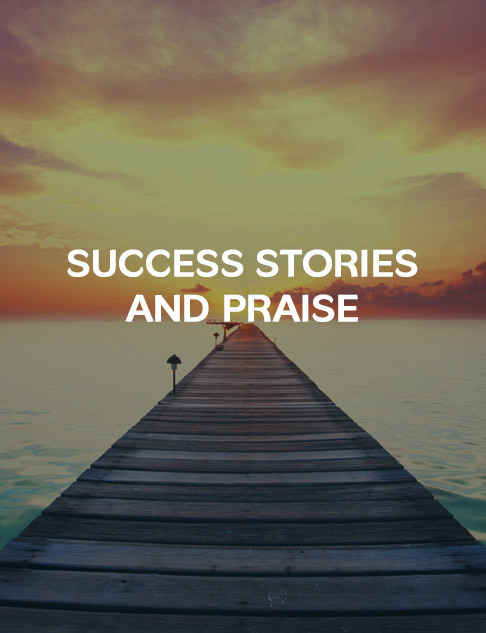 Having lived in 8 countries around the world herself Ann understands what you can and can’t do in different regions, and now with FFU clients for 43 countries successfully creating their wealth with FFU’s teaching, we can confidently say - YES FFU is for you. Regarding the specific reference to pension / retirement and tax free or protected investment mechanisms - many of these just have different names in different countries like an ISA - UK; ROTH IRA - USA ; TFSA - Canada and South Africa and NISA - Japan. These are all very similar tax free investment “pots” with very similar characteristics and benefits - just different names. The great thing is you will learn which of these are available in your country, you’ll understand the benefit and limitations of each and how to use them within your financial freedom plan to maximise the benefit for you. Copyright © 2013-18. Ann Wilson - All Rights Reserved.